I love me an interesting interior - and lately they just seem to keep getting better....I want to break down THIS room above (from the latest Lonny mag) to show you how to get that artistic, welcoming vibe. 1. A patterned rug - you can choose one with a geometric pattern and only 1 or 2 colours to keep it from getting too busy. (e.g. light grey + dark grey). 2. Try something natural - in this case the wooden table and floor bring all the warmth in - it would be a completely different vibe without it. 3. Add one other pattern to either the curtains or the walls. The trick with this is to use a different scale pattern than the rug. In the picture above, the curtains are patterned but have large white blocks on a slightly larger scale than the rug pattern, so it's not overwhelming. Notice how these patterns don't match, even remotely? 4. Keep something clean and empty - such as creamy white walls and joinery. 5. Add contrast - if most of your pieces are light coloured, add a black accent like the wrought iron + picture frame in the chairs above. Likewise, add white if you have a lot of deep colours. 6. Mix it up. One of my favourite things is seeing how different objects go together. In this case we have a collection of objects on the table made of: glass, ceramic, brass, and silver. They are all so different, but they don't look wrong together! 7. 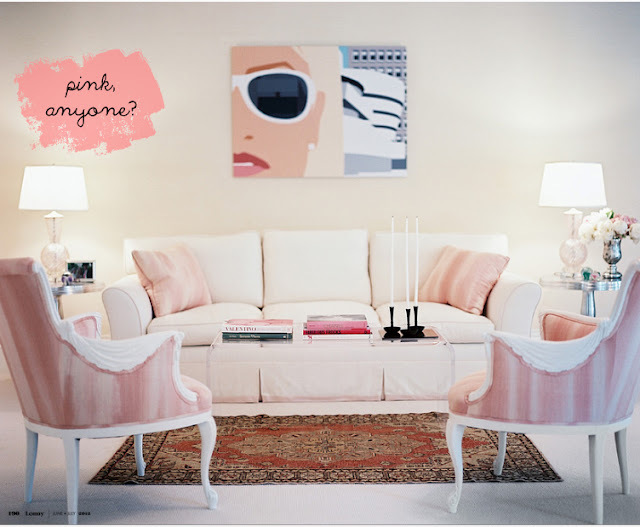 Add pink! Kidding - add flowers. Although pink flowers never seem to go wrong. Corals and oranges also pop perfectly. If you ever feel your room misses something... it's probably flowers! Seriously. Who's feeling the 80's oozing out of this picture? Or is it just me? Pink and white are always kinda awesome...(more of the best here). These pictures all come from the latest issue of Lonny - I recommend a peak! 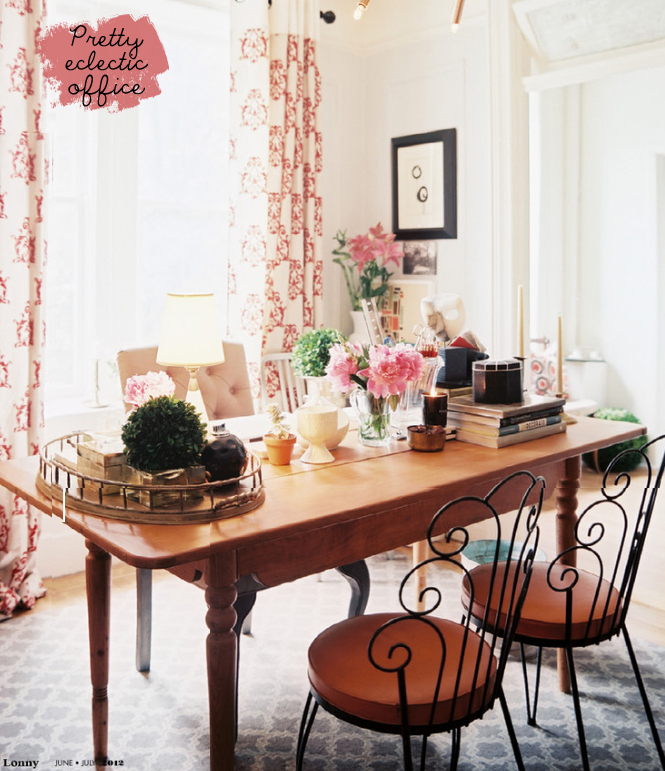 I love the office space, the rug is gorgeous, definitely going to file this one away for future reference! Such a post worth bookmarking! I love the photos you selected and your tips are great. Thank you for putting this together! These are such great photos and tips. I love Lonny, such a great source for inspiration. ah, that wall hanging is banging.... reminds me of these super 80s mirrors with a pink lady silhouette on them one of my best friends had in her basement. love it!